Well, it’s been more than 6 months since my last pound-for-pound ranking. While the pound-for-pound list is mythical and basically akin to intellectual masturbation, it remains a fun exercise. Plus, I relish the debates that lists like this bring. Quite a bit has happened in the last half year. Floyd Mayweather fought twice. Roman Gonzalez impressed the hell out of everybody. Canelo and Lara fought each other. Wladimir Klitschko had a fight against his number 1 contender postponed. And oh yeah, Andre Ward still isn’t fighting. Both Erislandy Lara (ranked 15th) and Sergio Martinez (4th) have been dropped from the rankings. Lara was narrowly edged out by Canelo Alvarez, in a fight that could have gone either way. Lara hasn’t lost much ground, however, and could return to the ranking with a decent win over a contender. Martinez, on the other hand, lost badly to a smaller man in Miguel Cotto who is past his prime and somewhat shopworn (though not shot). Martinez was hurt in the 1st round, and was never able to completely recover. His persistent knee issues combined with his age are likely to keep the former middleweight champion from ever regaining a pound-for-pound spot. It took me a couple weeks to finish this post (balancing work and home life along with writing can be a bear), and a few fights have occurred since I started. Last week, an up-and-coming featherweight from Jamaica, Nicholas Walters, endured a rough 2nd round to eventually overpower the smaller and older Nonito Donaire. I was prepared to move Donaire up from 13 to 10 before this fight, but now he’s been dropped from the top 15 altogether (and falls somewhere around 30 for now). Nonito has had an excellent career, and has some impressive wins, but he’s on the older side for a sub-lightweight, and doesn’t have the dedication that he used to. He may still have a future dropping back down to 122, but for now, he’s clearly outgunned by large and powerful featherweights like Walters. As always, the true measure of ranking fighters is based on who they fought. Resume is 90% of the point. Losses will drop someone in the ranking, but wins over weak opposition won’t necessarily raise someone, either. Career achievements matter only as a baseline, but losing, or not fighting top opponents, will eventually drop any fighter. I was all set to finish this article with Golovkin just outside of the top 15. His resume has gradually improved, and while he has yet to defeat an “elite” fighter, his list of top-10 scalps had grown to the point of at least being considered for a top 15 spot. Then, last week, Golovkin fought Marco Antonio Rubio on the same card as the Donaire-Walters fight. Nonito Donaire, who I was preparing to list at number 10, was blasted out in 6 rounds by the “Axe Man.” While I still think highly of Donaire, and believe he actually fought pretty well against the larger and stronger Jamaican, I could not find a space for him in the top 15 anymore. As for GGG Saturday night, he took on the same basic level of competition that he has for the past two years. It’s not been amazing, but his opponents have been solid. Enough top ten opponents, all absolutely brutalized, and it adds up. One could make arguments for the likes of the recently-deposed Erislandy Lara, linear middleweight champ Miguel Cotto, or top cruiserweight Marco Huck as being better choices for the number 15 spot. And while all thee have fought better competition for a longer period, the last two years or so have been better for the man from Kazakhstan. Gregorz Proksa, Matthew Macklin, Daniel Geale, and this weekend’s victim Rubio were all top ten middleweights, and solid, world-class fighters. And none of them lasted longer than 5 rounds. 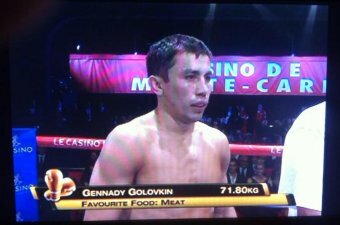 For now, I feel comfortable placing Golovkin here. I think Geale and Rubio would likely agree. Juan Estrada isn’t a household name in the States, owing to both his Mexican birth, and his diminutive stature. However, the little badass from Sonora is shaping up to be one of the toughest and most accomplished 112 pounders in the world. Estrada’s first big fight happened less than 2 years ago, against legit pound-for-pounder Roman Gonzalez. While Estrada lost, he went the distance against the powerful Gonzalez, and acquitted himself well. He followed that up with a big upset win over then-pound for pound entrant, and long time veteran Brian Viloria. Further wins over Milan Melindo and Richie Mapranum led up to his September showdown with longtime terror Giovani Segura. Estrada dismantled the hard punching Segura, and stopped him in 11. This potentially sets up a rematch with the streaking Roman Gonzalez, which would be a huge fight at the lighter weights. Estrada may only be 5’4”, and he fights at a weight considered small for a jockey. But he’s a bad man, and he seems to be improving his skills at the still-young age of 24. Hopefully we see more of him over the next few years. Canelo moved into my top 15 with a narrow July win over the formerly 15th ranked Erislandy Lara. The fight was a close, tactical one, in which Lara seemed to do just enough to lose, rather than Alvarez taking the fight. However, the slower Alvarez landed his share of punches, and certainly made the fight close against a tough opponent. For several years, many fight fans derided the young star’s resume as puffed-up and artificial. Many demanded that he face tough style matchups. So he took on and defeated the lanky, awkward, and skillful Austin Trout. He then fought the slickest boxer in the sport in Floyd Mayweather. While he lost clearly to Floyd, Alvarez didn’t take a beating, and didn’t embarrass himself. He didn’t take a soft touch in his return bout, either (though the style matchup was more favorable for him), in obliterating Alfredo Angulo. While Angulo has known limitations, he also gave the incredibly skillfull Lara hell in a competitive loss. This lead up to yet another hard fight against a skilled and quick spoiler. At this point, the rather methodical boxer-puncher has fought 3 of his last 4 fights against slick boxers, and lost only to the very best. Alvarez has earned a top 15 spot, and while his fame still exceeds his accomplishments, the gap is narrowing. Alvarez can fight, and he’s gonna be a big name for a while if he keeps up his current form. The conqueror of Nonito Donaire is in this spot entirely due to his April 2013 win over Donaire. His resume is extremely thin, otherwise. Rigondeaux has undeniable talent. Incredibly quick, agile, and skilled, he may be among the two or three best defensive fighters in the game. However, his style emphasizes minimal contact against his better opponents, which leads to a general lack of excitement. Other than a late knockdown against Donaire, even Rigondeaux’s signature fight was without drama. But the win itself was so comprehensive, and against such a talented and accomplished fighter, that it made sense to rank Rigo among the pound-for-pound elite. However, with Donaire’s loss to Walters, there is less need to keep Rigondeaux elevated above him. Unless El Chacal takes on a top opponent soon, he’ll find himself dropping fast. One win, no matter how impressive, doesn’t make a career. The ageless wonder is set to return this weekend at the age of 49 against the best fighter at light heavyweight, and possibly the hardest puncher (pound-for-pound) in the sport. Hopkins has won three straight fights in the last 18 months against top ten opponents. If he were 25, his resume for the last two years would be considered excellent. At nearly 50 years old, it’s just mind-boggling. We’re so used to seeing Hopkins as an elite fighter for so long, it can be easy to forget just how amazing he is. Doug Fischer of the Ring has stated that Hopkins is the only active fighter who deserves to be considered an all-time-great, and based on career achievements, I’m inclined to agree. In 2011 and 2012, Hopkins defended his linear light heavyweight championship against Chad Dawson in two ugly fights. Chad was a bad style matchup for the old man, but he was the best possible challenger the the throne, so Hopkins made the fight. That simple. The best fight the best, and Hopkins knows it. Since his May 1993 decision loss to Roy Jones, the Alien has fought 27 times against men ranked in the top ten of the same division he was competing in, going 19-4-2-2(8) (and 21-5-2-2(8) against all Ring-rated fighters). He is easily the most accomplished fighter in this list, and arguably the greatest fighter of this generation (sorry, Floyd and Manny fans). Yet, after all this time, at nearly 50 years old, he’s still fighting the best opponents. Truthfully, one could argue a higher place, pound-for-pound, right now than number 11. And, if he defeats Sergey Kovalev next month, it could be plausible to rank him back in the top 3. Mikey has been inactive since January, keeping his ranking in stasis for the time being. Mikey has been plagued with “promotional issues,” meaning he sued Top Rank back in April. Nothing is currently scheduled for Mikey, who has spent more time talking about fighting Floyd Mayweather and Manny Pacquiao, and moving up in weight, then actually resolving his promotional issues. Garcia, as mentioned in April, had been on a nice two year run, beating good fighters and in general looking like a beast at 126 and 130. Inactivity, however, is terrible for a young, elite fighter. He’s wasting his prime, feuding with Top Rank. One way or another, his dispute needs to be resolved. If Mikey hasn’t scheduled a fight by January, he’ll drop off my pound for pound list. Danny’s had a rough 2014, despite going 2-0 so far this year. Before the last ranking in April, he squeaked by Mauricio Herrera, in a fight that was supposed to be a showcase tune-up, and instead turned into a very close fight that arguably could have been scored the other way. Danny followed up this near catastrophe with an easier tune-up against Rod Salka in August. This time, Danny had an easy fight, dropping Salka three times and obliterating him in the 2nd. Salka had no business in the ring with a top ten fighter, much less the world junior welterweight champion. Danny is following this fight with what is likely to be yet another tune up. Garcia is undenably a talented fighter, but one who is “swiftly” losing public support. He appears to have fallen in the trap that many elite 140-154 pound fighters do; Resting on past accomplishments, avoiding risky matchups, while awaiting a potential shot at Mayweather and/or Pacquiao. This approach has notably backfired on Amir Khan, and to a lesser extent, Devon Alexander. Danny has made it known that he eventually wants a shot at Floyd. One would hope he is willing to continue testing himself while he waits. The heavyweight champion is due to defend his title on November 15 against Kubrat Pulev. Pulev is a 6’4″ Bulgarian with solid boxing skills and decent power, and is arguably the best opponent currently available for Klitschko. He represents the best challenge on paper since Povetkin, or perhaps David Haye. Of course, heavyweight is a notoriously shallow division, so Wlad is mostly succeeding through sustained dominance rather than facing a murderer’s row of top opponents. Nonetheless, the younger Klitschko has been the linear champ since 2009, and has been the best heavyweight since 2006. He has defeated more than a dozen top contenders, and four (soon to be five) men who were considered the number one heavy – with the exception of himself and his brother, of course. It’s tougher for a heavyweight to crack a pound-for-pound list, and Wlad has certainly done more than enough to earn this status. In some ways, the long-time super middleweight contender is the most underrated fighter on this list. The Cobra is a great example of the weaknesses of the “eye test,” which is a trap many boxing fans (and even some experts) fall in to. He isn’t particularly quick, he has an awkward style, sometimes he appears off balance, he holds his hands low, he takes too many shots… he simply doesn’t look all that impressive. Yet, he’s been facing (and usually beating) world-class competition in almost every fight since his December 2008 win over future linear light heavyweight champion Jean Pascal. Only one of his 12 fights from that point on was against an opponent outside the top ten (Yusaf Mack). And while he almost always appeared to be the less-athletic, less-fluid man in the ring, he came out victorious 10 out of those 12 times. Most recently, Carl fought an entertaining rematch against George Groves, an athletic and skilled young contender, who previously gave him a beating before succumbing to a questionable stoppage late in their first bout. The second fight started Groves’ way again, but this time around, Froch established his power earlier, and forced Groves to respect him from the beginning. Froch eventually caught up to the younger man, and laid him out with a beautiful, highlight-reel right cross in the 8th round. Despite his age (37), and his rough, give-and-take style, Froch has shown little decline in his skills, and remains the second-best super-middleweight in the world, and one of the most accomplished fighters, period. Only Andre Ward has defeated Carl decisively, and with Ward’s inactivity, Froch has become the defacto boss of the division. Potential money-making fights against the likes of Gennady Golovkin, Julio Cesar Chavez Jr, and perhaps Bernard Hopkins await the man from Nottingham. At this point, Froch has earned a big event fight, and will likely go after one before he retires. Since April, the flyweight monster dubbed “Chocolatito” took on another top opponent. Akira Yaegashi, a very accomplished fighter from Japan (who himself was knocking on the door of some top ten lists), was blown away in 9 punishing rounds by Gonzalez. The man from Nicaragua was too powerful and too aggressive for Yaegashi. Gonzalez has built an impressive resume for his age (27), is the reigning Ring Magazine and TBRB champion, and appears to be in his prime despite 40 fights under his belt. He’s already scheduled to take on Rocky Fuentes in November, which would be his fourth fight of the year – a busy docket for a modern top fighter. A rematch against an improved Estrada would be a great matchup, and would likely make for an exciting fight. Since my last update to these rankings, Marquez took on Mike Alvarado, a top contender at junior welterweight, and yet again turned back the challenge of a younger, stronger fighter. Alvarado is no world beater, but he’s a credible contender, and despite coming up in weight, is a naturally larger man, coming off a pair of exciting brawls with Brandon Rios. Marquez solidly outboxed the younger man, winning arguably every round save for the 9th, when Alvarado came alive and scored a knockdown. The win was roughly similar to Pacquiao’s comeback win last year against Brandon Rios, and actually made Marquez a mandatory for Pacquiao’s welterweight belt. Marquez himself has made it clear he has little interest in a 5th fight with his long-time rival, satisfied with the end result of their 4th fight from 2012. Still, he remains, at 41, a top welterweight contender, and one of the best fighters in the world. The future hall-of-famer has more potential big fights on the horizon, and will likely remain on the boxing scene as long as he wishes. Tim Bradley hasn’t fought since his decision loss to Pacquiao back in April. He’s scheduled for a December fight against welterweight fringe contender Diego Chaves, which amounts to a stay-busy fight at this point. Chaves is not without talent, but he has lost 2 of his last 3, getting knocked out by Keith Thurman in July 2013, and being disqualified against Brandon Rios this past August. Chaves doesn’t have anything to really challenge Bradley with, and should be a win for Tim, provided Chaves doesn’t get lucky. Tim is athletic, talented, and experienced, having given two solid fights to Manny Pacquiao, (regardless of the official outcome) and taking an outright win over Marquez at welterweight. Before moving up to 147, Bradley beat several top contenders at junior welterweight, establishing himself as one of the best fighters in the world. Bradley has speed, stamina, durability, and solid boxing skills. His tenacity and will have kept him going in difficult situations. The only real knock on Bradley as a fighter is a relative lack of power, though this has only been a problem against Manny Pacquiao so far in his career. Tim has stated he wants big fights, and should be able to find them. Hopefully boxing politics and inactivity don’t conspire to keep a talent like Bradley out of the ring. Speaking of inactivity… Andre Ward actually had a solid case for being ranked number 1 on this list after his dominating win over then-lineal light heavyweight champion Chad Dawson. Ward had won almost every round of the Super Six tournament before that, handling the best super middleweights in the world from 2009 to 2011. Wins over Mikkel Kessler, Carl Froch, and Chad Dawson over a three year period, with solid victories over Arthur Abraham and Sakio Bika sprinkled in, amount to arguably the best resume in the sport during that span. However, the man known as S.O.G. has only fought once in the past year, a glorified stay-busy fight against solid but unspectacular Edwin Rodriguez last November. And, starting from immediately after his Super Six-clinching win over Carl Froch, Ward has only fought twice in the last 47 months. Ward has been locked in conflict with his promoter, the recently deceased Dan Goosen, for nearly that entire time. Since Goosen’s tragic death last month, little has been heard on that front, but eventually, Ward will need to resolve the issue and get back in the ring. Big fights await, and a potential superfight with Gennady Golovkin lurks around the corner. For now, he has been inactive for 12 months, so unless he schedules a fight soon, Andre’s not gonna be on my next pound-for-pound list. Here comes the controversy. Why is the universal choice for pound-for-pound supremacy relegated to the number 2 spot on this list? Am I just a hater? Have Floyd’s endless out-of-the-ring shenanigans warped my sense of his accomplishments? Well, not quite. It really comes down to resume, specifically, recent resume. For a few years after Floyd’s return from his post-Hatton “retirement,” Manny Pacquiao held the top spot in most pound-for-pound rankings. Floyd simply wasn’t doing enough to take the spot back from Manny. Some switched them after Manny’s 2012 “loss” to Tim Bradley. Personally, I saw a clear win for Manny over a better opponent than Floyd’s then-recent win over Cotto. Manny beat Bradley far more easily than Floyd beat a past-prime Cotto, so for me, Pacquiao solidifed his pound-for-pound lead over Mayweather. However, late that fall, Pacquiao ran into the perfect right hand from his long-time rival Juan Manuel Marquez, and that, combined with Floyd’s own win over Marquez, made the choice for P4P #1 pretty easy. This was two years ago. What changed? Well, Manny rebounded with a win over a solid fighter in Brandon Rios, followed by an excellent win over the number 3 P4P entrant in Tim Bradley this past spring. While this was happening, Floyd fought Marcos Maidana twice. Maidana is certainly a tough fighter, and not a bum, however, he also was arguably no more accomplished than one Brandon Rios. Even more damning, Maidana made a credible case for earning at least a draw the first time around with the man called Money. Scores of 7-5 Maidana, 6-6, and 7-5 Mayweather were all common among the boxing cognoscenti. Maidana pressured Mayweather in a way not seen since Jose Luis Castillo 12 years and a dozen pounds ago. To Floyd’s credit, just like his close call against Castillo, he agreed to the rematch, and like Castillo, won the second fight more clearly. Even then, Maidana had his moments, hurting Floyd badly at one point, and doing significantly better than Guerrero or Canelo managed. Here we go. Manny Pacquiao, reclaiming the number 1 pound-for-pound spot. He has been linked to Mayweather for half a decade now, despite the failure for both of them to meet. Most of my reasoning behind Manny’s elevation was covered in Floyd’s section. All I will add here is that much of the reason behind Pacquiao’s new rank is basically due to default. Floyd’s weak showing, Ward’s inactivity, Marquez’s loss to Bradley, and Bradley’s loss to Pacquiao all equate to a PacMan ascendency. This feels potentially temporary, though. Pacquiao is clearly slowing down, and has an odd and potentially difficult matchup coming up against Chris Algieri. A poor showing or a shock loss to the New Yorker could shake up the ratings once more. Stranger things have happened, and will again. This entry was posted in boxing, pound-for-pound and tagged andre ward, April 2014, bernard hopkins, canelo alvarez, carl froch, danny garcia, erislandy lara, floyd mayweather, Gennady Golovkin, Guillermo Rigondeaux, juan manuel marquez, manny pacquiao, miguel cotto, mikey garcia, November 2014, pound-for pound, ranking, roman gonzalez, sergio martinez, timothy bradley, Wladimir Klitschko. Bookmark the permalink.